Please Enter Your Height. Examples: 5 feet 7 inches , 6 feet 2 inches, etc. Please enter your weight in pounds. Please measure around your waist, giving us the measurement in inches. Measure abdomen at the widest portion of your mid-section. Please select any additional pockets that you would like sewn onto your vest. Once your order has been completed, we will contact you to verify where you would like the pockets positioned. A study from the University of Wisconsin Eau-Claire has shown that police officers that wear load bearing vest carriers experience significantly less hip and lower back pain than those that wear only a duty belt. Our load bearing vest carriers (also known as external carriers) are proudly made in the USA and keep you safe while you protect others. 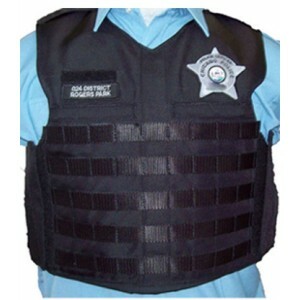 Our load bearing vests are made to exactly fit each officer's bulletproof vest and perfectly match the officer's uniform. With just a few simple steps, we ensure that you'll receive a product that helps to reduce your hip and back pain. As an industry leader in load bearing vest carriers and custom vests, we work with you until you're 100% satisfied. We take pride in our American Made products fully stand behind our products. If there's something you'd like that you don't see, please contact us. Using the tape measure, measure your chest as shown in diagram 1.A. Write down the measurement. Measure your vest from back to front as shown in Diagram 2.A and Diagram 2.B. The measurement should go from the bottom of the back panel of your vest, over your shoulder, to the front of your vest. Write down the measurement. Measure the gap from the bottom of your front panel to the top of your duty belt as shown in diagram 3.A. Write down the measurement. When you have finished these steps, please fill in your color preference and measurements in the fields above. Round your measurements up to the next inch. We will need two pictures of the Officer in uniform wearing his or her body armor: one picture of the officer facing forward towards the camera and one of the officer turned to the side wearing his or her body armor. Please be sure the entire body armor vest is visible while being worn on the officer. We will need photos of both of the Officer's ballistic panels: one photo of the front panel and another photo of the back panel. A photo of the items you want pockets made for, laid out on front vest panel in the position you would like the additional pockets. For example: if you want a radio on the right side of your vest carrier and a flashlight on the left side, place them accordingly. Please reply to the follow-up email with the photos attached. The email may take up to 20 minutes to receive. Your order will not be completed until you send the photos listed. After you reply to the follow-up email, someone from Bluestone Safety Products will be contacting you within 24 business hours. The vest fits great along with all of my equipment inside. Overall, I am very satisfied with Bluestone Safety. I recommend Bluestone Safety to all Law Enforcement Agencies. I just had my first vest made at BlueStone and I am extremely impressed with it! The quality of vest is excellent, it was custom made to fit and it fits PERFECTLY! The customer service was wonderful, everyone here is extremely welcoming and willing to help with what ever your needs are. I will absolutely recommend them in the future! I would like to extend my sincere appreciation to BlueStone Safety Products for your service with custom fitted Bulletproof vests and vest covers to our department since 2008. Blue stone vest carriers are custom made and are a perfect fit. They hold up to a beating and do not fade. The customer service is second to none and they are always eager and willing to help and make adjustments to what you want without any issues. Great Place!!" I will only use/order Blue Stone Safety Products. Last vest carrier lasted me 8 years and switched to a load bearing vest. Love it and all my guy's want one now.